Cleaning in pharmaceutical manufacturing is a critical process and it validation id important to ensure the proper cleaning of the equipment. Worst-case identification plays an important role in selection of products for cleaning validation. It is not possible to carry out cleaning validation of all products manufactured in the facility. Therefore, products are selected on the basis of the worst case. Worst case is the condition when it is difficult to clean the residues of the manufactured product from the equipment surface. Different parameters are considered during the worst case identification in pharmaceutical cleaning validation. The solubility of the API in water plays an important role in the cleaning of the equipment. Insoluble API shall be hard to clean comparing the freely soluble one. 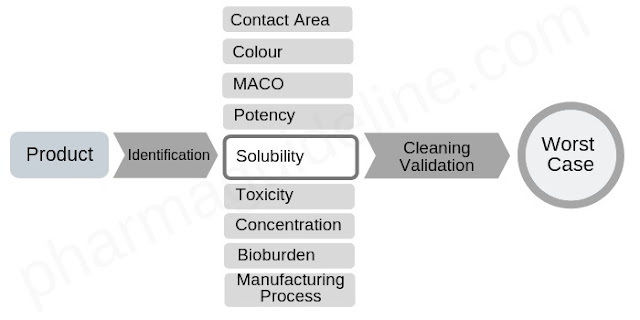 Therefore, the solubility of API is an important factor in cleaning validation. A product containing less soluble or insoluble API shall be considered as worst case and shall be selected for cleaning validation. If two products have the same solubility in water then other factors are considered to select the worst case. Products having a low quantity of API are highly potent while the products with a low quantity of the API are low potent products. Highly potent products are more active and a low amount of those can cause an effect on the user. For example a product containing 1 mg API is more potent than the product containing 10 mg API means a small quantity of API is effective. Therefore, the highly potent product is considered as the worst case in cleaning validation. MACO is another parameter that helps to identify the worst case in cleaning validation. Lowest MACO value is considered the worst case for cleaning validation. The product containing higher MACO value will have higher LD50 value hence the product will be less toxic than the product having lower MACO value. Toxicity of the API is determined by the LD50 value. The API with higher LD50 is less toxic than the API having lower LD50 value because a very low quantity of it is toxic than the other one. Therefore, the product with API containing lower LD50 is considered the worst case in cleaning validation. Percentage of API concentration is another parameter for worst-case identification. The residues of product on equipment having more concentration of API will contaminate the next product more than the product with low API concentration. The product having higher API concentration is considered as the worst case. Some product colors are difficult to clean. Some coating colors are insoluble in water. Products containing colors are considered the worst case compared to products without color formulation. Contact surface area is also a parameter to identify the worst case. If two products are manufactured in different size of equipment then the total quantity of the product will be more on the big equipment than the quantity of product on the small equipment. In this situation, the product manufactured on big equipment shall be considered as the worst case. Products having excipients those support the microbial growth as starch, lactose, sucrose, gelatine, lactose etc. are considered as the worst case because microbial growth may occur on equipment surface having residues of these products. Products that are manufactured by aqueous granulation method or any other activity that can increase microbial load in the product have possibilities to develop microbial growth on the equipment surface. These products are considered as the worst case in cleaning validation. Every new product added in manufacturing must be compared with the existing worst-case product and assessed for the above parameters. If the new product qualifies for the worst case assessment then cleaning validation of the new product must be done.